The Utah State standout hopes having a brother in the NFL will give him a leg up in trying to break into one of the most competitive sports leagues in the world. Making the transition from college football to the pros is never easy, but it does help to get a little inside information from somebody that's been through the process before. 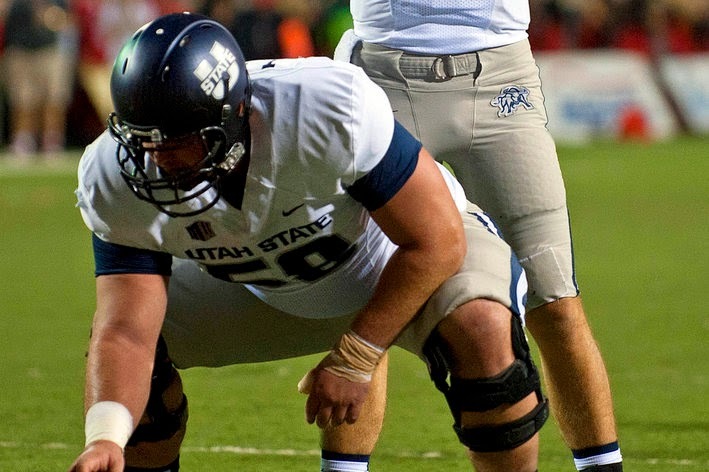 That's the case for Utah State center Tyler Larsen, who says the advice he's getting from his NFL brother will give him a leg up when he arrives at a training camp this summer. Cody Larsen just finished his first year as a defensive tackle on the practice squad of the Baltimore Ravens, and he's been eager to share his experiences with his younger brother, who has built himself into one of the top center prospects in the draft after a standout college career. Ranked as the No. 5 player at his position by SB Nation, the younger Larsen sat down to discuss his draft preparation, what teams he think may be eyeing him and the possibility of joining Cody in Baltimore. What did you think of your performance at the NFL Combine? Well I didn't do the 40 because I had a strained hamstring, but I really knocked it out on the bench. I got the second-highest reps for the o-line. That definitely put me out there on the radar. All the meetings we had every night with coaches, one-on-one, I feel like I did a really good job. So I think I put my name on the radar for many teams and raised my stock. What all will you be doing at your April 1 pro day? I'm not doing most of the stuff I did at the combine. I'm happy with the numbers I put up. I will be doing the 40, and I will be doing the position drills. You played in the Senior Bowl. How was that experience? I think I did a really good job at all the practices, which is the main part of the whole week. I've had some great offseason training. I'm doing everything that I've hoped for. Is there anything in particular you're focusing on in training? Yea, I've been told to focus on my hip flexibility, and I've been trying to strengthen my legs so I can rely on them more without bending my waist. You're projected as a fifth- or sixth-round pick. Do you have any expectations about when you'll be drafted? Not yet. Right now I'm just happy that there are people out there saying I'm going to be drafted. So I haven't even gotten to that stage. Your brother, Cody, just finished his first year on the Baltimore Ravens practice squad. What kind of advice has he given you about going through this process? He says try to keep busy and try not to think about the draft. And once you're in there, it's a whole new world. Everyone's trying to provide for their family, and they're not about to let a rookie come in there and take their spot. The competition level in practice is unreal, he said. Do you think having someone like that to give you advice gives you an advantage heading into a training camp? Absolutely. I feel like it would be the natural reaction to just go through the motions the first couple days and I think that could potentially hurt people. So knowing what it's like will definitely be an advantage for me. What would you think of joining him in Baltimore? That would be sweet. I would love to play with my brother. Baltimore's a great team. I don't see a way I could be any more happy than to be out there with my brother, competing with him everyday. I was actually committed to the same school as he was before I got the scholarship offer to Utah State. So that was a little heartbreaker — we were excited. His senior year we actually got to play against each other, so that was just great. He was nose tackle the whole entire game so every single snap we were going at it. In the wake of the Miami scandal, player hazing has become a major story in the NFL. Have you talked to your brother about what to expect as a rookie? I actually haven't talked to my brother about that. But I'm just expecting the usual. You go in as a freshman, it's the same thing. You're fresh meat. I hear you have to take all the veterans out to dinner, stuff like that. You expect the little things, but I don't think it will be that bad. Any good hazing stories from your freshman year? No, not really. I was able to kind of stay in the shadows, so they didn't give me too much crap. A lot of center prospects end up playing guard at the next level. Are you preparing for a possible position change? Oh yea, definitely. I've for sure been focusing on being able to play guard. It's almost the same position, you're just off the ball. So I feel very comfortable playing guard. Is there much of a technical change between center and guard? Honestly, no. Sometimes you might get a little wider techniques at guard. But outside of that, you're right up close with the defensive players rather than the athletic rushers outside at the tackles. Coming from the Mountain West, you haven't faced the same type of competition as some of the guys from the bigger conferences. What do you think the competition hike will be like at the next level? At the Senior Bowl it was a little bit faster, but it was faster going from high school to college. You just have to adjust pretty quick. People are going to be faster and going to be stronger, but that's just expected. What do you anticipate being the biggest transition you'll have to make going from college to pro? The fact that you don't have to go to school and it's a full-time job. I've talked to people that say you're there at 6 and you get out at 6. That's going to be a big transition to get used to, but, you know, the reason you go into the NFL is because you love the sport. So it should be an easy transition, but it should be a lot different from a university. I didn't get a chance to watch the Utah State offense last season. Describe the system you ran. We were a spread mostly, but when it was time for short yardage we had some pro style, so I got a taste of both. With our run game we were mostly a zone-based, power scheme rather than man. The past season we were a three-man fly, two-man protection-type deal. How different will it be playing in a pro-style system in the NFL? I got a taste at the Senior Bowl, but it's a lot more base-type running. I know for sure the pass protection is a lot more complex. The running scheme will be a lot different. We never had a fullback [at Utah State] and we had a fullback on just about every single play we ran [at the Senior Bowl]. You do see guys like Chip Kelly introducing a bit more of the spread concept in the league. Do you think ending up on an offense like that wold ease the transition? Yea, for sure. I definitely do. How closely are you following the offseason moves? Do you have an idea of what teams are looking for centers? Yea, actually I have. I saw the Colts released their center. I know a lot of centers are getting close to their contracts being up. The Cardinals' guy is getting a little bit on the older side, San Diego Chargers, as well. I've definitely been keeping my eye out on that. I've heard a little bit about Cincinnati. I'm definitely trying to keep track of who needs one and where I could possibly end up. Where will you be on draft day? Will you be watching on TV? I'll be watching. My wife actually has a softball game out at UNLV so I'll be down there in Vegas, just hanging out in my hotel room watching there. My family's going to come down there as well. Vegas isn't a bad place to celebrate getting drafted.